The small Ertl figure looks to be from the The Alamo Quarter Horse Farm Set from 1983. PM address if you're interested in cards. 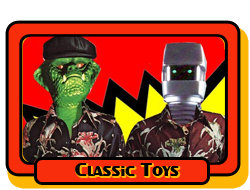 Okay so these were kind of like the monster Little Big Head toys they came out with a few years ago, but in the very early 80's. They had a red or blue colored head or body and were about two to three inches tall and looked kind of like a werewolf. They were vinyl or plastic toys sold mostly in dollar stores like Dollar General or Family Dollar etc. it is driving my buddy Circus Envy insane trying to remember what these were called. It is not the Mego Clown Around Werewolf but similar; similar but not exactly. It was wearing a white suit and some had a completely blue head and others had a red head. I like the look of Antifreeze. Never seen that figure before. A lot of the 90s Action Man seemed to be much more popular in the UK- I don't even know if that figure was sold much or at all in the states. I'm surprised I find anything at all in this line. I don't recall seeing anything, aside from the actual "action man" in stores at all. And even then, I think I've only seen him in "Giant Tiger" which is like a cheapo type department store. retails for about $7.99 so shows up all the time in thrift shops here. But, 99% of the time it's just "action man" and I'm really only interested in the villians. Their execution is off from what I hoped a 12" action figure would be by 2012, but the ideas are superb, really really under-rated. if you combined the ideas of Action Man Villians with the quality of Sideshow. That's really what I was expecting toys of "the future" to be like. Last edited by 4NDR01D; Mar 23, '12 at 7:30 AM. I have recently developed an interest in Action Man- and more towards the villains - Dr X (of which there are numerous variations) Professor Gangrene (don't have any of him yet) Antifreeze and there is one or 2 others. Another line that was basically the same as the 90s Action Man was Max Steel- there is a villain in that series called Psycho- one figure featured an "exploding" face and bionic robot arm! I've totally combined the two lines to the point where I kinda thought they were the same thing, i'll have to do some reading to sort them out. I have the exploding head guy, very inovative, . I have a big muscle guy with a bionic arm but havent found any room to display him. I really like toxic robot figure the the one with the squishy guts. dont think they were available here in canada. All times are GMT -5. The time now is 9:58 PM.